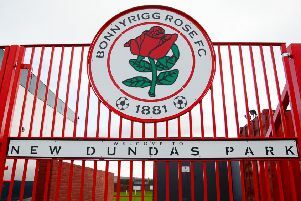 Super League champions Bonnyrigg Rose will face local rivals Newtongrange Star in the final of the Fife and Lothians Cup next week after they knocked out Linlithgow Rose 4-1 at New Dundas Park tonight. There was no league-winning hangover for David White’s Bonnyrigg as they brushed aside Linlithgow to book their place in the final, which will be held at Broxburn Athletic’s Albyn Park next Wednesday. Bonnyrigg were given a guard of honour by visitors Linlithgow after they secured their second league title in three seasons in a 2-2 draw away to Hill of Beath last Saturday to end their time in the Juniors ahead of next season’s move to the East of Scotland League. Striker Keith Lough handed the New Dundas Park side the lead after 15 minutes when he headed in Keiran McGachie’s cross. Utility man Alan Horne then doubled the hosts’ lead less than four minutes later – his long range lob sailing over the head of goalkeeper Darren Hill and into the net. The visitors were quick to pull a goal back after the interval, as club record goalscorer Tommy Coyne netted from the penalty spot four minutes into the second half. Home midfielder Lee Currie, who secured the title for Bonnyrigg on Saturday with a trademark free-kick, soon restored the two-goal advantage when he volleyed home from the edge of the box. White’s men made sure of their final spot two minutes from time when Dean Brett lashed home after striker Wayne McIntosh set him up.